Pastor Skip Hietzig said that pride is the national religion of Hell. It’s pride that the sinner proudly glories in. Wicked people will not seek after God; that is, they will not call upon Him. They live without prayer without God. They have many thoughts, many objects and devices, but don’t bother to think of the Lord. There is no submission to His will. The cause of this is, of course, pride. In Exodus 33:1-7, the Hebrews had forsaken God, forgotten about their covenant with Him, had fashioned a golden calf and had not obeyed God’s Word. C’mon, now! After witnessing the miracle of deliverance of the Red Sea, after receiving the manna and water, after being given quail to eat, this is how they thanked God? No wonder He called them a stiff-necked people. It’s a miracle in itself that He just didn’t smite them on the spot! But that speaks of God’s incredible grace and mercy. And the reason they were stiff-necked was because they were lovers of themselves rather than of God; they were sinful and they were proud. As a consequence, God refused to go with the people up to Canaan. Upon hearing this, the people were grieved and took their ornaments and jewelry off. By their stripping off their ornaments, the Lord discerned the first symptoms of contrition. The people were ashamed and sorrowful for their behavior. Des-pite their knowledge of God, they acted against Him. What good would these objets d’art do? Nothing. The removal of the tent of the meeting place was moved outside their camp, too. Now, that their communion with God had been removed, they realized the implications of moving forward without God. So, where does that leave us in the 21st Century? Humanists and their kind believe that there can be peace without Jesus Christ, but the truth of the matter is that there can be no peace without Him. This belief and ideology stem, in part, from the Hellenistic time. The Greco-Roman influence in philosophy and science, among other things. You can say they were pre-Missouri types: Their attitude was “Show me.” They prided themselves in their knowledge. And therein lies the problem. Human knowledge can only take you so far. You see, when you make an absolute statement, such as “There is no God”, absolute proof is required. The declaration "There is no God" is what is known as an absolute statement. For an absolute statement to be true, you must have absolute knowledge. Is it possible that there is knowledge you haven't yet come across to prove that God does indeed exist? If you are truly reasonable, you will have to say, "Having the limited knowledge that I have at present, I believe that there is no God." In other words, you don't know if God exists, so you are not an "atheist". Instead, you are what is commonly known as an "agnostic." You are like a man who looks at a building, and doesn't know if there was a builder. You are the proverbial fence-sitter who doesn’t mind the discomfort of indecision. Since neither side can empirically prove or disprove the existence of God, it comes down to faith. For those who require the necessary evidence, I have one simple message: Don’t worry, on the Day of Judgment, you will have all the necessary proof that God is real. In fact, every knee shall bow and every tongue will confess that Jesus Christ is Lord. Unfortunately, by then it will too late to repent. That’s why it’s very important to trust in the Lord NOW rather than later. God doesn't want you to go to Hell. Please, forget your philosophical arguments, repent and put your trust in Jesus and be saved from God's wrath. Make Psalm 51 your prayer (include the name Jesus in your prayers), then read your Bible daily and always obey what you read. So, please put away your pride, that hollow orna-ment of man, and repent. Come to Christ and have eternal life. Believe it and you shall have it. The purpose of WON ministry is to proclaim the Gospel of Jesus Christ. This ministry strives to present the Good News to other Christians and non-believers alike. 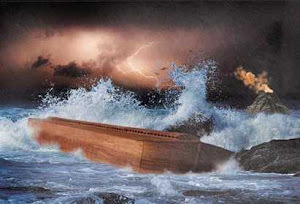 In particular, Waters of Noah places an emphasis upon ministering and cyber-witnessing to non-believers by explaining the Truth that is found in the King James Holy Bible. Based out of Yakima, Washington, WON is basically a one-man operative ministry of Rodolfo de Leon. All opinions and errors are solely mine. All truth is provided by Jesus Christ.